For book lovers it is always a task to organise their books. Bookworms always find less storage space in their cluttered book racks and shelves. They struggle to organise their books which leads to so much of time wastage in locating and searching the books. Proper stacking and organisation of your books is important if you want to save time. Also neatly organised racks is a pleasing sight for the onlookers and helps them to browse your collection easily. Store your books alphabetically according to title or author – This method is suitable for those people who are good at remembering titles and names. If you place all the books by the same author together it will help you in identifying the book quickly. You can even arrange your fiction and non-fiction books separately alphabetically. It saves time while searching. Place the books according to size – Place heavier books on lower shelves and less heavier books on bulky shelves. This is the best way to balance the book shelf. This storage method looks visually neat because of size order. Genre of the book – You can even categories and arrange your books according to its genre like fiction, non- fiction, educational books, autobiographies, etc. Colour coordination – Makes identifying books by its spine colour easier. 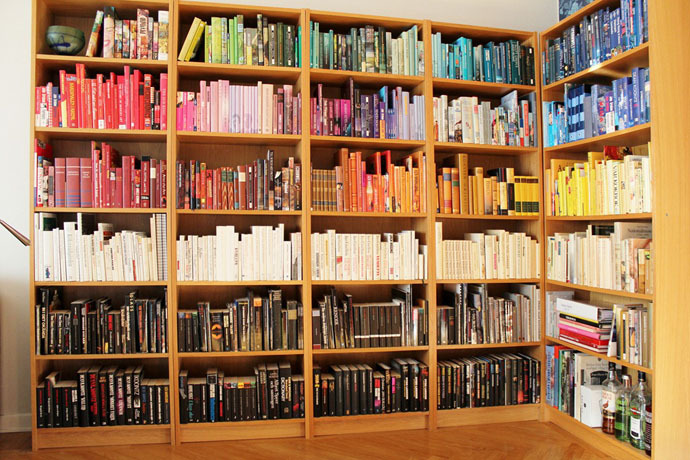 You can either organise it chromatically across bookshelves or as colour blocks. If you are good at remembering colours and illustrations on the books then this could be an easy way for you to retrieve your books. Identification through markers – This will enable you to further clarify and narrow down your search through various genres and topics. Choose coloured tapes or other markers with permanent adhesive so that they don’t peel off or tear easily. • Chronological order – This method is also followed by some people who like to arrange their books according to the year or the century it belongs to. It works well if you are good with dates and months. Books are irreplaceable in everyone’s life because of the knowledge it provides and helps us in nurturing and Conditioning our mind. Hence, it is imperative for everyone to store their books properly and take great care of them. One can buy education books online at www.haranandbooks.com and choose from their huge variety on offer. ← Why people prefer buying books online?